Join us on Saturday, April 27th for the 20th annual Golden Hawk Football Dinner at Lazaridis Hall located on Wilfrid Laurier's Waterloo Campus (75 University Avenue West, Waterloo). This year's event will feature a keynote address from Donnovan Bennett and Sid Seixeiro. 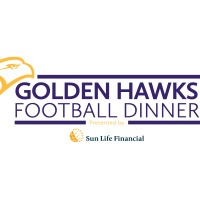 The Golden Hawk Football Dinner raises money for the growth and development of the football program, coaching support and enhancing the student athlete experience.